Keto cornbread (coconut flour) it’s a delicious low carb alternative to traditional cornbread. 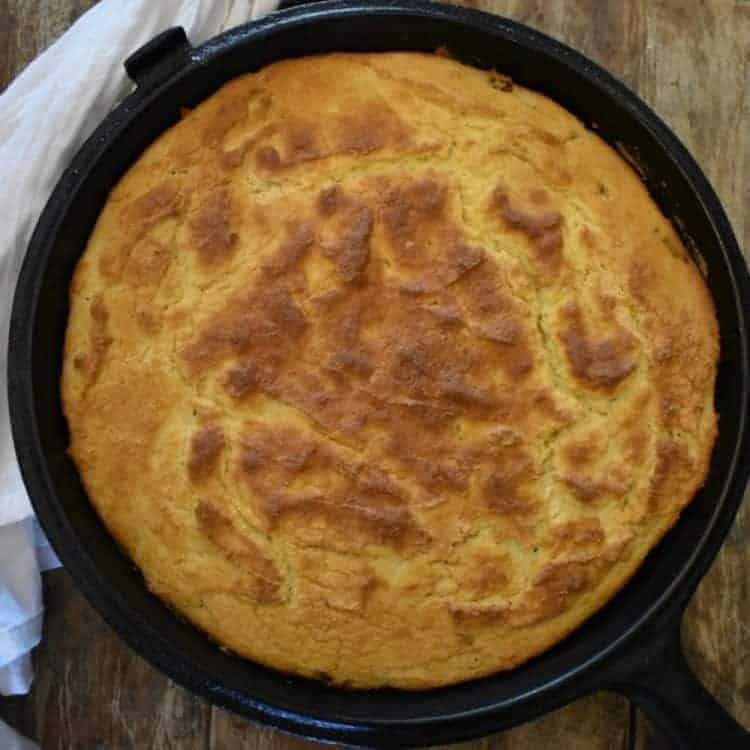 By using coconut flour in place of cornmeal you can enjoy a “cornbread” that is grain-free, gluten-free, nut-free and keto-friendly. Enjoy all the flavor and texture of cornbread minus the high carbs. Swapping out cornmeal for coconut flour produced bread that mimics cornbread perfectly. If you’ve been searching for a cornbread that is low carb, gluten-free, grain-free and nut-free, search no more. Because my keto cornbread (coconut flour)recipe delivers all this. Plus it’s a keto-friendly cornbread that will fool your taste buds into thinking you’re having the real deal. My low carb cornbread uses absolutely no corn, cornmeal, or grains. Not even baby corns make it into this recipe. 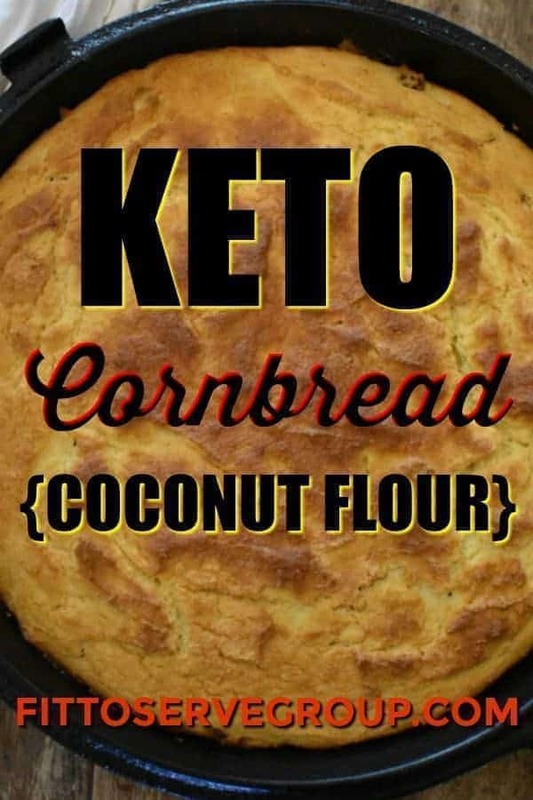 And because it’s made with coconut flour it has the added bonus of being even lower in carbs than my Easy Keto Cornbread (Skillet) Be sure you also check out our Keto Cornbread Recipes for creative ways to substitute cornmeal. Making this low carb coconut flour cornbread takes only a few key ingredients. You’ll need eggs, cream cheese, heavy whipping cream, butter and of course coconut flour. The recipe is as simple as measuring your dry ingredients, then your wet ingredients and combining the two. There are no hard to come by ingredients in this keto-friendly cornbread. There is one tip I’ll share that I feel helps make a cornbread tasting option out of coconut flour. That is, that I bake all my cornbread recipes in a cast-iron skillet. Although it’s not necessary to use a cast-iron skillet, I feel it really enhances the texture of your “cornbread”. Because the bread develops a more authentic crust due to how well a cast-iron skillet retains heat. It also helps that I preheat the skillet and add butter to the pan before filling the pan with batter and baking. If you still don’t own a cast-iron skillet and you’ve been unable to pry one from your grandma, I encourage you to consider getting one as soon as you can. Don’t take my word for it, ask grandma why she loves her pan. I assure you, that you will get plenty of use out of your skillet. A quick search on our site and you’ll see I have both savory and sweet recipes that call for a cast-iron skillet. 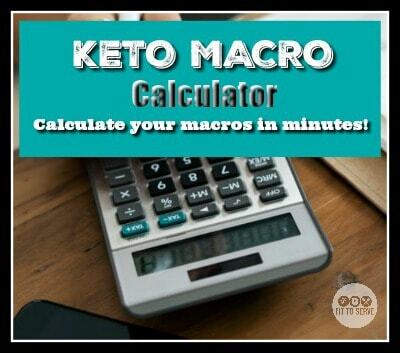 Trust me, I’ll give you plenty of keto recipe options that will have you pulling it out often. I will add that it should be already seasoned so that it’s non-stick from day one. Like I mentioned earlier, I preheat my cast-iron skillet prior to adding the batter. 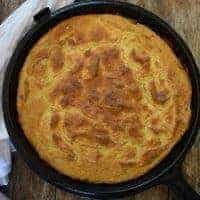 It’s something I learned years ago when I would bake traditional cornbread and it works beautifully with keto cornbread too. Trust me, it’s so worth the extra step to ensure you are getting the perfect flavor and texture. You should know that it’s super easy to add a few extra ingredients to your keto coconut flour cornbread to make it extra special. 3/4 cup of shredded cheddar cheese. Add 1/2 cup of cheese to half the batter and then after you add the rest of the batter top with the remaining 1/4 cup of cheese. This gives you two layers of cheddar goodness. Add fresh or pickled jalapeños to the batter. I add 1/2 cup of pickled jalapeños and only 1/4 cup of fresh but you can certainly adjust the amount to your liking. Crumble 5 strips of cooked bacon into the batter before baking. This gives a nice smokiness flavor to your low carb cornbread. Or add all three for keto bacon, cheddar, jalapeño cornbread that is sure to make you swoon. If you’ve been wondering if you can eat cornbread on a keto diet, the answer is a resounding NO. There simply is no such thing as keto diet cornbread. Well, I’ll take that back because although no cornmeal is used in this recipe it makes a great mock cornbread. However, there are some recipes out there that add things like baby corn to their keto cornbread because baby corn isn’t very high in carbs. I’ve even seen some recipes that combine real cornmeal with almond flour. But honestly, I don’t understand why they would add either. Not only is corn way too high in carbs to be considered keto friendly, but it’s also a GMO loaded grain that should be avoided by anyone dealing with insulin resistance, pre-diabetes or any form of inflammation. Personally, I want nothing to do with the real thing. Thankfully you can make a fantastic keto cornbread with either almond flour or coconut flour without the need to add corn. So don’t despair because both my recipes will convince you to leave the corn out. It may seem hard to believe that you can make a delicious keto cornbread by using coconut flour alone. But that’s exactly what this simple recipe does. I decided to make this recipe after having several requests for a coconut flour cornbread option. Thankfully, after years of keto baking I now have a greater understanding on how to use this tricky low carb flour. Coconut flour is a very dry, thirsty alternative, which makes it impossible to just swap cup for cup with regular flour. When using coconut flour instead of almond flour you must increase the moisture content of the recipe in order for it to work. With that knowledge, I was confident that I could create a cornbread option that was not only low in carbs but also nut-free. 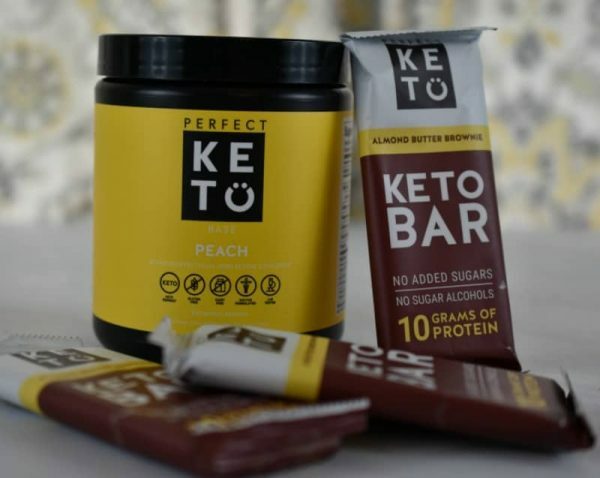 Knowing that quite a few people in the keto community can’t consume nut flours but can safely use coconut flour has encouraged me to create more keto recipes that use it. Of course, there are some individuals that are very sensitive to nuts and also get a reaction from coconuts, so proceed with caution if this is you. Wondering what to serve your keto cornbread with? How about our easy keto chili, or keto chicken chili (slow cooker)? Or perhaps our keto broccoli cheese soup? I can list recipe after recipe where you’ll love a wedge of keto cornbread. But of course, you could also just have this cornbread all by itself, because it’s that good. Melt the 3/4 cup of butter in a microwave or small saucepan and set aside. !Dry Ingredients In a medium sized combine the coconut flour, sugar substitute, baking powder, sea salt then set aside. !Wet Ingredients: In a large bowl beat the eggs, cream cheese, heavy whipping cream, water, melted butter (the butter should have been allowed to cool after melting to avoid scrambling the eggs)Use an electric mixer to combine well all the wet ingredients. Add the dry ingredients to the wet ingredients.Then mix the batter by hand until fully incorporated. Take the now hot cast-iron skillet out of the oven and add the tablespoon of butter to the skillet. Carefully swirl the butter into the cast-iron. The butter will melt quickly making it easy to coat both the bottom and sides of the pan. Pour the batter into the hot skillet. The batter will sizzle, don't worry this is a good thing. It's what provides the cornbread flavor and crust. Place the skillet back into the oven and bake for 25-30 minutes until lightly brown. The keto cornbread (coconut flour) will be done when an inserted toothpick comes out clean. Recipe calls for a 9inch cast-iron skillet but can also be baked in a 9 inch cake pan or in a muffin pan that bakes 12. 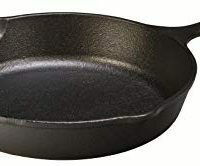 If you are not using a cast iron skillet generously grease a 9 inch cake pan with a tablespoon of melted butter and swirl to coat the bottom and sides of the pan. Skip the step of heating the pan in the oven before adding the batter. You should only be doing this step if you are using a cast-iron skillet. Make sure your cream cheese is full-fat and not whipped. Allow it to come to room temperature before mixing so that your ingredients incorporate well..
Yay Julie! You have no idea how much this encourages me. Enjoy in good health darling. Thanks for stopping by. In the oven as I type 🤞🏽 Made some Keto chili to go with it. First time making both 🤞🏽🤞🏽. Smells amazing! Yay Judith! Both those recipes are super easy to execute. Is it possible you can add pictures or do a short video, I’m currently making it however I don’t think it is coming out correctly. I made this tonight and it was delicious! Mine wasn’t really a batter, and didn’t brown on top, but it was the closest thing I’ve had to cornbread since starting Keto. Thank you for this awesome recipe!! Hi Stephenie, Glad you enjoyed it. Just tasted it and it’s great! My son has egg allergies but can handle 1-2 eggs per recipe so I used 2 full eggs, 2 flax eggs, 1 energy egg replacer, one gelatin egg, as well as two TB of arrowroot Powder. It wasn’t pourable at all. But it was still easy to spread into the hot cast iron skillet. It’s puffing up nicely and it tasted good before it was cooked. I was hoping for something very similar to jiffy cornbread, but it’s still very very good!! Hi Tiffany, keto baking can be a little tricky. So not sure if your substitutes changed the recipe a little too much. In the end, I hope it still was a good option for your son. Blessings. Delicious!!! Second time making it. Good with my coffee in the morning. Thanks for sharing. Hi Beverly, Glad you enjoyed it Darling! I tried your coconut flour corn bread and bread was still wet and bitter after 35 min. Every time I bake with coconut flour this happens. I use good organic brands and store my coconut flour in the freezer. Also, I follow recipes to a T. Any suggestions? I'm about ready to give up on coconut flour.